Hollywood movie studios, once excited to share their upcoming films with Comic-Con's captive geek audience, are abandoning the show en masse. 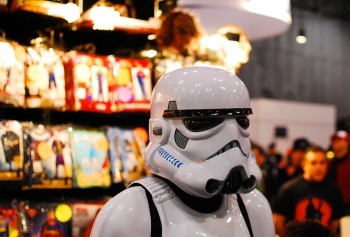 In recent years, the key focus of Comic-Con has slightly shifted. Yes, it's still a massive gathering of thousands of comic book fans hoping to catch a glimpse of the newest books from DC and Marvel (or, at least, cute girls dressed as Ramona Flowers), but thanks to Hollywood marketing muscle, a sizable part of the event has become dedicated to the promotion of the latest geek-centric films. Warner Bros. used the event to promote Sherlock Holmes and 300, Disney repeatedly staged outrageous stunts to promote Tron: Legacy and Marvel's film wing has long relied on Comic-Con to promote their latest superhero flicks. As the New York Times reports however, this year's event may be lacking in Hollywood stars. Comic-Con, as a growing number of movie marketers are realizing, has turned into a treacherous place. Studios come seeking buzz, but the Comic-Con effect can be more negative than positive. The swarm of dedicated fans - many of whom arrive at the convention in Japanese anime drag or draped in Ewok fur - can instantly sour on a film if it doesn't like what it sees, leaving publicity teams with months of damaging Web chatter to clean up. "It's a red-letter opportunity, but you shouldn't go simply because it sits there on the calendar," said Michael Moses, co-president of marketing for Universal Pictures. "You have to be absolutely certain you have goods ready that can really make a difference for your film." Warner Bros., Disney and Dreamworks have all bowed out of Comic-Con and even Marvel Entertainment, the NYT reports, "is on the fence about whether it will mount a major presentation" to promote The Avengers. Key to the suddenly skittish studios' decision were the middling returns for Scott Pilgrim Vs. The World. Though the $60 million film was a hit at Comic-Con, it only sold $32 million in tickets. The con won't be entirely devoid of films though. Fox and Sony plan to roll out heavy promotional campaigns for Rise of the Planet of the Apes and The Amazing Spider-Man respectively. The key point for discussion that this studio exodus raises is that Hollywood may have finally realized that perhaps the whims of the geek masses dedicated enough to attend a comic book convention (or post on Internet forums, or mail tons of peanuts to executives) may not directly correlate with the desires of the mainstream market. Geeks may be an extremely vocal minority, it seems to suggest, but they are still a minority.